In a playground this vast with so much to explore, you’re bound to have questions. Here you'll find park facts and answers to some of the most frequently asked questions. Or, chat with us live. Approximately 50 miles between its west entrance at West Glacier and its east entrance at St. Mary. That depends! There are various points of interest along the length of the road, as well as short hikes, if you’re inclined to pull-over. Without stopping, it takes about two hours. From the west entrance, Logan Pass is 32 miles. From the east entrance, it’s 18 miles. The road is open from mid-June until the end of September, weather dependent. For current road status updates throughout the park, visit the National Park Service website. Since weather and road conditions in the park can be unpredictable, this is a very good question. For real-time information, the Glacier National Park twitter feed is the best source of information. You can also consult the Logan Pass Visitor Center, Apgar Visitor Center, Glacier National Park Headquarters or the local visitor information center in the town where you are staying. Another great source of information is the National Park Service website, they have detailed reports for the status of park roads. From Kalispell, Whitefish and Columbia Falls, use the West Entrance, which provides access to the Lake McDonald area, Park Headquarters and the Apgar Visitor Center, and is the only west entry point to the Going-to-the-Sun Road. From Kalispell, head 30 miles northeast on U.S. Highway 2. The West Entrance is about 25 miles from Whitefish. Head south on U.S. Highway 93, turn left onto State Highway 40 E and continue onto U.S. Highway 2 E.
The West entrance is about 15 miles from Columbia Falls on U.S. 2 E.
From Great Falls and Browning, use the St. Mary, Two Medicine or Many Glacier entrances, which can all be reached by taking Highway 89 north from Great Falls to Browning (125 miles) and then following the signs to the respective entrance. For more information, as well as details about entering the park by air, train or shuttle, visit the National Park Service website. The St. Mary Entrance provides access to the Going-to-the-Sun Road as well as the St. Mary Visitor Center and services at Rising Sun. The Many Glacier Entrance provides access to the Many Glacier Valley and visitor services at the Many Glacier Hotel and the Swiftcurrent Motor Inn. Glacier National Park offers a free shuttle service for much of the summer season, with shuttles operating from Apgar Transit Center on the west side and St. Mary Visitor Center on the east side. Buses run every 15 – 30 minutes, with transit stops clearly marked along the Going-to-the-Sun Road. For more on the park's shuttle system, visit the National Park Service website. Xanterra offers guided red bus tours with driver commentary and tours leaving from the south side of the park, northeast side of the park and west side of the park. Glacier Park Inc. offers a hiker’s shuttle on the east side of the park between St. Mary Visitor Center and Many Glacier Hotel. Sun Tours provides interpretive guided bus tours through Glacier National Park, sharing the Blackfeet Tribe perspective and history in the park. 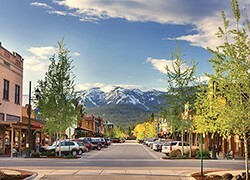 From Whitefish, catch a Glacier Park Express shuttle into the park’s Apgar Visitor Center, which connects to the park’s free shuttle. Named after nearby Going-to-the-Sun Mountain, the road was officially named during the 1933 dedication at Logan Pass. Local legend, and a press release issued by the Department of the Interior the same year as the dedication, told the story of the deity, Sour Spirit, who came down from the sun to teach Blackfeet braves the rudiments of the hunt. On his way back to the sun, Sour Spirit had his image reproduced on the top of the mountain for inspiration to the Blackfeet. An alternate story suggests a white explorer in the 1880s concocted the name and the legend. No matter which version is accurate, the road named Going-to-the-Sun still inspires all who travel it. Yes. To help reduce congestion on the road, vehicles and vehicle combinations longer than 21 feet and wider than 8 feet are prohibited between Avalanche Campground and the Sun Point parking area. Due to rock overhangs, vehicle and vehicle combinations more than 10 feet may have difficulty driving west from Logan Pass to the Loop. You can and you should. Every spring, cyclists enjoy the road before it’s opened to vehicular traffic. For safety reasons, bicycles are restricted from parts of the road from June 15 through Labor Day—peak visiting time. Fall is also a gorgeous time to bike the road. Visit the National Park Service website for more information about road closures due to plowing and peak-season visiting, as well as rules and restrictions. The Going-to-the-Sun Road is a two-lane, narrow road, reaching an elevation of 6,646. From the road, visitors experience breathtaking views of valleys and mountains, and at times the drop off from the road is steep. The road has a stone wall or guard rail on the outside lane, but for those with issues with heights, the east to west route will keep you on the inside lane. You certainly can. Jackson Glacier Overlook affords the best opportunity to see a glacier from the road. Jackson Glacier Overlook is located on the east side of the Going-to-the-Sun Road between Logan Pass and St. Mary. Your entrance fee into the park covers the drive and much more. For entrance fees and park entry information, visit the National Park Service website. Yes, five out of 13 campgrounds in Glacier are located along the road: Apgar, Sprague Creek, Avalanche, Rising Sun and St. Mary. Please see our camping page for more information. Gas is not available anywhere in the park or on the Going-to-the-Sun Road. Gas is available in East Glacier, West Glacier and St. Mary, as well as other surrounding communities. Food (breakfast, lunch and dinner) and lodging can be found in Rising Sun, Lake McDonald Lodge, Many Glacier and Apgar Village. Picnic areas can be found at Rising Sun, Sun Point, Avalanche, Sprague Creek and Apgar. For safety reasons, 40 miles per hour is the speed limit in the lower elevations of the road and 25 miles per hour in the alpine section. Logan Pass is the highest point on the Going-to-the-Sun Road at 6,646 feet. Glacier National Park is wild country, and wildlife may be present anywhere along the Going-to-the-Sun Road. Mountain goats and bighorn sheep are typically seen near Logan Pass. Wildlife can often be spotted in the Many Glacier Valley—north of the east entrance at St. Mary. Don’t get too close! Wildlife is just that—wild. Do not approach wildlife. Visitors are required to keep a distance of at least 100 yards from bears and wolves, and 25 yards from any other wildlife, including nesting birds. Visit the National Park Service website for more information about safely viewing wildlife. Glacier's western valleys tend to receive the most rainfall. Summer daytime temperatures can reach above 90 degrees Fahrenheit (expect slightly cooler temperatures in the higher elevations). Overnight lows can drop to about 20 degrees Fahrenheit and snow can fall at any time. Be prepared for a variety of weather conditions and pack accordingly, dress in layers and always bring rain gear. Drivers should always drive with caution during changing, inclement weather. Glacier National Park is breathtakingly beautiful in every season. While summer is our most popular time to visit, you can avoid crowds (especially at Logan Pass) and take advantage of shoulder-season prices if you visit during the spring or fall. Spring is the perfect time to bike the Going-to-the-Sun Road before it’s open to vehicular traffic and fall paints the park in stunning autumn hues. Both shoulder seasons are also excellent times to view park wildlife. Winter in the park offers a jaw-dropping wonderland of pure white. It’s our quietest and most magical time of year. If you’re visiting during one of our heavenly summers (peak season), you definitely won’t be alone. However, that doesn’t mean you can’t have an epic Glacier National Park experience. Plan ahead, book accommodations well in advance, and contact park personnel and surrounding community visitor information centers for advice or check out the Glacier National Park twitter feed for real time information on the best days and times to embark on your daily Glacier Country adventures. Hikers should consult the park’s trail status page to see trail conditions. Even if the Going-to-the-Sun Road is not open to Logan Pass, the park is still open with plenty of adventures to be had. Check out the Logan Pass webcam to see what the parking availability is. Insider Trip Tip: Explore beyond park boundaries into our charming small towns and epic recreation areas. Loop back to the park during our less busy times of day/season. Glacier National Park website and Twitter feed have real-time updates on parking lot statuses, road closures, weather, and other important visitor information. Check out their webcams to live views of some of Glacier’s most popular areas.